Roll out white bread dough on a lightly floured surface to form a 15 by 7-inch rectangle. Spread ½ stick of the softened butter on the surface of the dough then spread evenly with ½ cup brown sugar and cinnamon on top. Roll dough into a log and cut log into 1-inch slices. 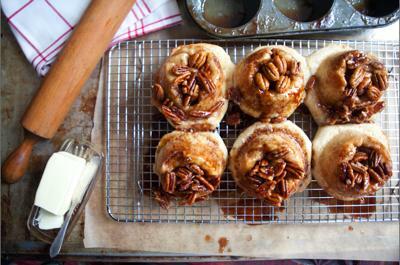 Use a muffin/cupcake tin to bake the sticky buns. Grease each cup with butter-flavored cooking spray. Use the remaining butter and place a dollop at the bottom of each tin, then sprinkle with ½ to 1 teaspoon of brown sugar and 3 to 4 pecans. Then, sprinkle a little salt and a wee drizzle of molasses in each cup, fill each with a dough slice and you are ready to ROCK! Bake for 15 to 20 minutes. Remove from oven when golden brown and FLIP THEM IMMEDIATELY onto a wire rack or cookie sheet. Serve warm. Makes 12.